Nielsen's Florist Garden Shop proudly serves the Darien, Connecticut area. We are family owned and operated, and are committed to offering only the finest floral arrangements and gifts, backed by service that is friendly and prompt. Because all of our customers are important, our professional staff is dedicated to making your experience a pleasant one. That is why we always go the extra mile to make your floral gift perfect. Let Nielsen's Florist and Garden Shop be your first choice for flowers. 8:00 a.m. to 6:00 p.m. Monday through Saturday, and 10:00 a.m. to 5:00 p.m. on Sundays. Our shop will always be closed on the following holidays: Christmas Day, New Year’s Day. 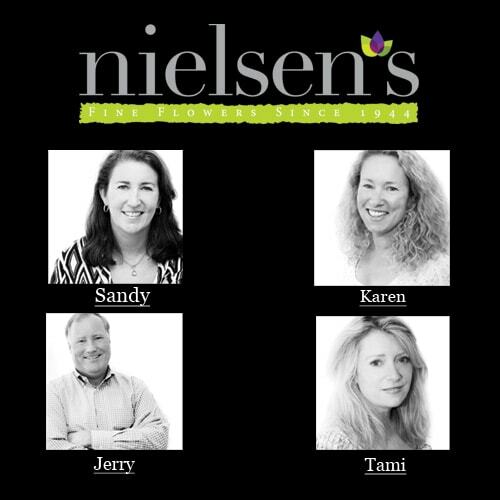 If you have any questions or need more information, please email us at nielsen@nielsensflorist.com or contact us directly at (203) 655-2541. We're always here to serve you and make your flower-sending experience a pleasure. Nielsen's strives to make every customer happy. Should you be dissatisfied with your purchase, our return policy is as follows: Return of purchases made with a credit or debit card can be accepted with or without a receipt for up to 30 days. Any returns made after 30 days and up to 180 days from the original date of purchase will be given a store credit. Please be aware, cash or check purchases will not be accepted without a receipt. Exceptions: Live plants can be returned up to 14 days with a receipt for any reason. However, we will not be able to accept returns for plants that have been out of our care for over 14 days. Store credit will not be given on returns for live plants. Our flowers are guaranteed for 7 days. Please contact us within 7 days if you are dissatisfied. Sale items. Any discounted items are final sale; returns will not be accepted for any sale items. Trees or shrubs purchased and planted by the customer are guaranteed for one year and can be replaced once at half the cost. If we have planted the trees or shrubs for you, we will replace them at no cost to you. We do not guarantee our pots against frost. Container garden plants are not guaranteed for any length of time due to the many variables involved in planting. However, if you choose to use our maintenance program, we will replace any plants as needed at no cost. Earrings cannot be returned at any time, for any reason. This is in accordance with state law. Nielsen's reserves the right to use our discretion on any returned items.